The estimation of BIS Research on the global blockchain healthcare market is $5.61 billion by 2025. Medicalchain uses the blockchain technology, creating a user-focused electronic health record that allows for the maintenance of single accurate version of user’s data. This technology enables the user to give access to their health data allowing interactions between a medical professional and the user records in the auditable, transparent, secure and decentralized ledger. Increased expectations of the Patients for the safety & security of their data. The fragmented health services across the world, do not have a single version of the truth, i.e., different lab reports, different scans, different doctors, etc. Patients are mobile; however, data is not portable. According to Reuters, it is estimated that the medical information is ten times more worth than a credit card on the black market. Lack of Transparency with increasing costs, insurance frauds with no accountability. The technology allows the user to have control and ownership of the data. The user can give access to the medical professional, and he/she will write data on the blockchain. Data Security is ensured due to double encryption mechanism on a closed, permission-based blockchain. Medicalchain works on a user-centric model. There is single user data in chronological order than multi-fragmented data such as blood tests, imaging, and clinic letters. IoT enable devices like Apple HealthKit, Fitbit, Nest, and Qardio can be integrated into a blockchain, and with permission, the medical professional can access these data. In the event of an emergency, when the patient is incapacitated or unconscious, a wearable device can be unlocked. This is achieved by two clinicians agreeing that accessing the information is in the best interests of the patient. As records are kept on a blockchain, only authorized parties can access the data allowing patient and doctors to reach each other through the internet. This allows for Borderless and Social Care with minimal costs with the addition of transparency and cost-effective premiums in Insurance. 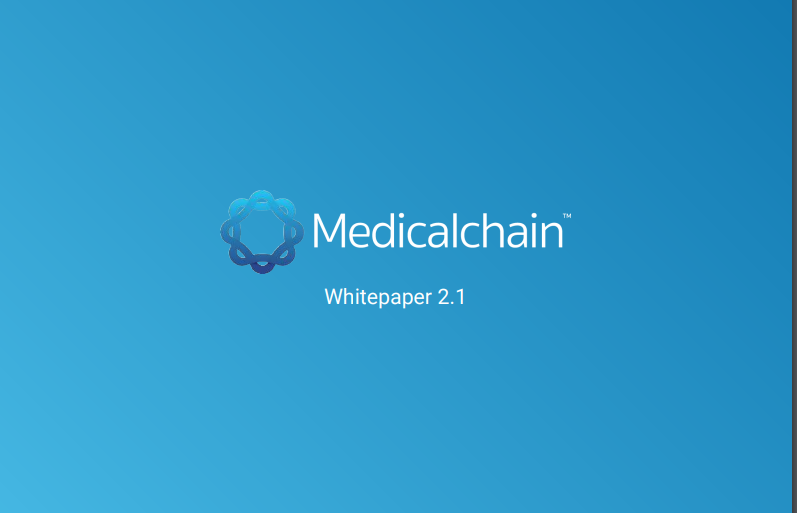 We have read and written many whitepapers for our ICO marketing services, however, Medicalchain Whitepaper is personalized like a magazine. This gives a fresh outlook to the Whitepapers. The font and color are soothing to the eye. The problem statement and solutions are explained precisely. The whitepaper is highly informative with use of simple English and statistics to push their point. It is whitepaper model for others to follow. On entering the website, you are attracted to the project than ICO offerings. A button that leads to buying the MedTokens on the top right corner and follows as you scroll to the bottom. Though Medtokens stays on the back of the mind due to the button following you, Medicalchain is more focused on talking to you about the project than the concept of ICOs. We have looked at many websites during our research, and we had found a common trend that the first impression is about the ICO rather than the project. However, we believe that project should attract investment and not the other way around. Medicalchain has built a brand around Dr. Abdullah Albeyatti, CEO & Co-Founder of Medicalchain. Being a Doctor with NHS, he can convey the message of the need of Medicalchain with clarity and authority. 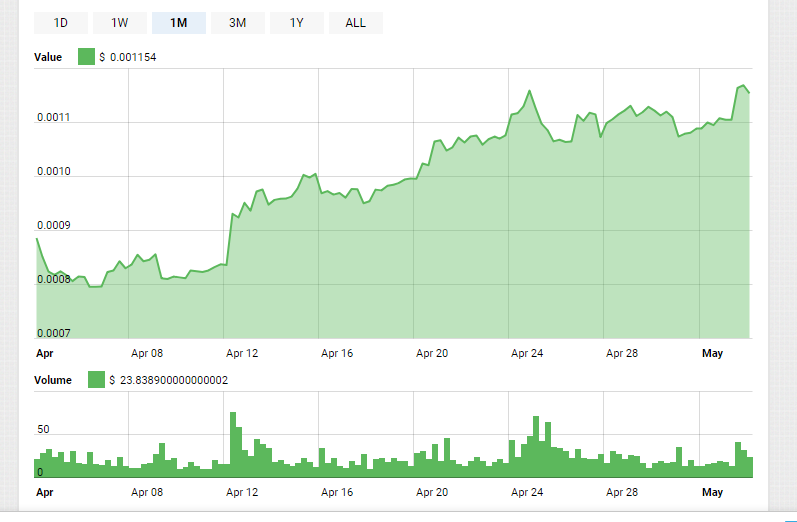 Medicalchain talks about their cryptocurrency pricing every day. There are at least six press releases on different websites; however, they convey the same message about the growing pricing of Medicalchain. Also, every day there is a press release with increasing market capitalization, showing crypto-world that they are growing every day targeting the Fear of Missing Out (FOMO) investors. 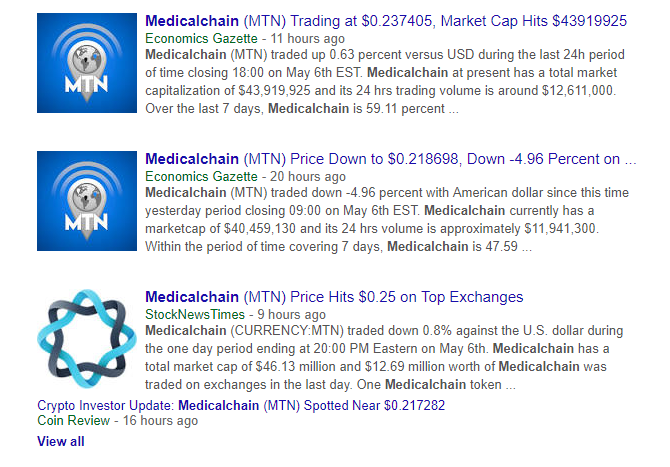 Though Google News section talks about the growth of Medtokens, Google Search Page has something entirely different. The ratings on ICO rating & listing websites and medium blogs dominate the Google Search Page. Though Medicalchain is technologically advanced, their branding is still old school. The leadership team attends Blockchain conferences across the globe making the brand of Medicalchain visible to the Blockchain world. 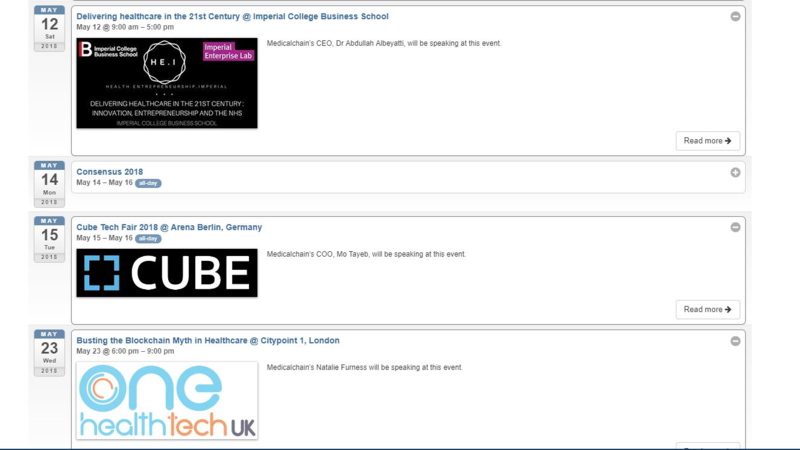 The company has invested heavily in branding especially in attending and being speakers on Blockchain Conferences across the UK, Europe & Middle-East. Medicalchain had eight rounds of Pre-sale and Pre-ICO, from the price in the first round $0.10 and steadily rising to $0.22 in Round 8. The current market cap of Medicalchain is approximately $37 million with a total trading volume of around $14.7 million and a daily trading volume ranging from $1 – $5 million. The company has closed its ICOs. However, the token is available in exchanges like BITFINEX, Huobi.pro, KuCoin, Gate.io, Qryptos & Coinbene Cryptocurrency Exchange. Medicalchain is going to revolutionize the healthcare industry. The Team working on this technology is experienced in the field of Medical Data & Data Analytics with Blockchain. Medicalchain plans to expand throughout the world by 2019. The above-discussed points have allowed ICOs rating site to give them a rating of 4+ by Experts. This Integrated Marketing Communications with attractive website & Whitepaper has made Medicalchain raise approx. $24 million in Pre-ICO & ICO.